I learned the feeling of playing a melody and playing long phrases from Tommy Dorsey. I learned more about the idea of rhythm and swing with Art Blakey than any other drummer in my career. Tatum made me feel at ease, even though it was very difficult to work with him because he had a chord progression every two beats. Keys didn’t matter to him. He played through everything; even when you soloed, you accompanied Art Tatum. It was my task to try to keep up with him, and occasionally, when I did, I was gratified. Note: The last three quotes are from a 1999 Ted Panken interview with DeFranco. To read the whole thing, go here. I wrote somewhere else that as a young clarinetist, I came to Buddy earlier than Goodman, but about the same time as Shaw. Buddy was simply amazing. One of my desert island discs is Buddy’s version of “Out of Nowhere” for MGM Records (reissued on the HEP label) when he had his own big band in 1951. It starts off very simply, as if the producer asked him to make sure to play the melody. His improvised chorus is also simple, played in the low register, and then he explodes. The remainder of the solo is all over the instrument, with a quote from “Fascinating Rhythm” thrown in. When I first heard it I was in shock following this virtuoso turn which was over too soon. I remember playing it many times so I could memorize it. I later shared this story with Buddy when I worked with him briefly. 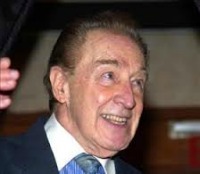 Buddy DeFranco might have been the greatest clarinet player ever. Thanks for bringing Ted Panken’s wonderful interviews to us.